Shepherd junior starting pitcher Ryan Potts (13), pictured here in the Rams' 4-1 home victory against Queens College on March 9, shut out the Blue Knights' offense through the first 10 innings of play, but the Rams' offense struggled even more against the Blue Knights in the opening game of the double-header on Thursday afternoon against the Blue Knights. (William Ransom/The Picket). 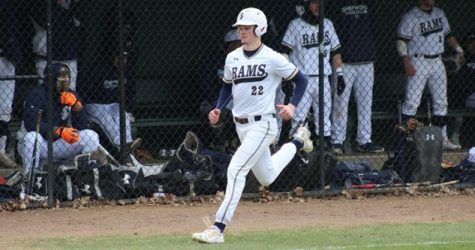 The Shepherd Rams baseball team (15-11, 10-4 MEC) split its double-header with the Urbana University Blue Knights (6-22, 6-8 MEC) in Shepherdstown, West Virginia, on Thursday afternoon. The first game of the day between the two teams was a scoreless game until the top of the 11th inning, when Urbana senior Zeth Tanner sent a two-run home run to left field to give the Blue Knights a 2-0 lead that they would go on to win by. In the second game of the day, the Rams’ offense performed at a high level, producing 12 runs in its 12-5 victory. Shepherd junior starting pitcher Ryan Potts, who had a no decision for the Rams, pitched a gem for the Rams on Thursday afternoon in the opening game against the Blue Knights. In 10 innings of work, Potts did not surrender a run while only allowing four hits and walking three batters. Potts clearly frustrated the Blue Knights’ batters, striking them out 14 times in what was a stellar performance to say the least. The only real trouble that Potts faced in the entire game came in the top of the fourth inning. Blue Knights junior right fielder Mickey Losey and junior first baseman Austin Pratt had back-to-back singles in the top of the fourth inning with one out, as the Blue Knights were trying to gain some kind of momentum against Potts. Much as he did the whole game however, Potts answered the challenge and got the next two Blue Knights’ batters to fly out and ground out, respectively. 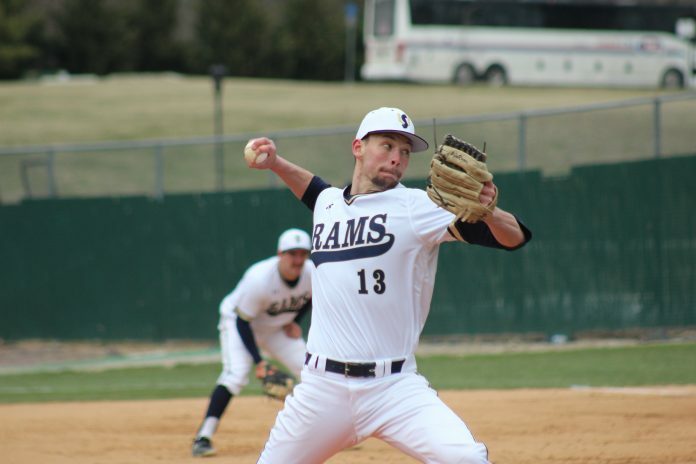 Potts was performing well on the mound for the Rams, but offensively, the Rams would not find success hardly at all against Blue Knights’ senior starting pitcher Vitor Takakura. Against the Rams, Takakura, who also recorded a no decision against the Rams, allowed just two hits in seven innings of play while walking just one batter and striking out six. Similar to the Blue Knights, the Rams’ best chance of scoring happened in the fourth inning, this time the bottom half of the inning. 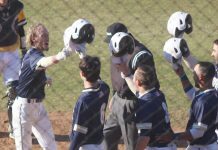 After a single to third base by Rams sophomore catcher Christian Hamel, Takakura threw a wild pitch in the next at-bat to Rams junior first baseman Justin Smith. This allowed Hamel to make it to second base to get into scoring position. Smith drew a walk later on in the at-bat, putting two Rams on base with no outs. Unfortunately for the Rams, their next three batters would go on to strike out, ground out, and strike out, respectively, to close out the inning, wasting a golden opportunity. Shepherd did have another solid chance to score in the bottom of the seventh inning as well. Rams senior third baseman Chase Hoffman reached on an error by Blue Knights senior third baseman Connor Coy. Shepherd sophomore pinch runner Riley Lazich came in to pinch run for Hoffman after the play. After a groundout by Rams junior left fielder Reid Entsminger, Lazich advanced to second base, setting up a great scoring opportunity for the Rams. Takakura would put Lazich in an even better scoring position with his costly balk in the next at-bat, which sent Lazich to third base with just one out. The theme of the first game of not being able to drive runners home would continue for the Rams here, however, as the next two batters for the Rams produced ground outs that would once again end a chance to put the Rams out in front on the scoreboard. The game would remain scoreless until the top of the 11th inning, when Tanner delivered his clutch two-run home run for the Blue Knights off of Rams sophomore relief pitcher Mitchell Johnson to give them a 2-0 lead that would end up being the final score. Johnson (L, 2-1) allowed two runs on three hits in the top of the 11th inning, but the Rams’ inability to produce runs offensively is the main reason why they lost this particular game. Blue Knights relief pitcher Robbie Guerrero (W, 2-3)entered the game in the bottom of the eighth inning and went on to pitch the final four innings for the Blue Knights, earning the save in the process. Guerrero allowed just three hits, walked two, and struck out three in his relief appearance for the Blue Knights. The second game of the day saw the Rams’ offense come to life to the tune of 12 runs on 10 hits, helping to fuel its 12-5 win over the Blue Knights. Defensively, the Blue Knights were not on the top of their game in this one, as they committed four errors against the Rams. This would help contribute to the six-run bottom of the third inning for the Rams that saw them take a 6-0 lead. Rams outfielder Brenton Doyle (22), pictured here in a prior home game, and the rest of the Rams’ offense really did not get going until the second game of the day against the Blue Knights, when they scored 12 runs as a team. 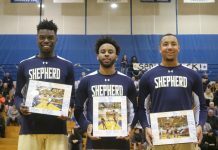 (Photo Courtesy of Shepherd University’s Athletics Department). Tanner, who played catcher for Blue Knights, had trouble defending a double steal attempt by the Rams in the bottom of the third inning. Seeing two Rams’ runners taking off as Blue Knights starting pitcher Steven Beall was delivering his pitch, Tanner stood up and made an errant throw to one of his teammates. This error allowed Rams junior right fielder Nick Atkinson to reach third base after successfully stealing second base, while Rams sophomore second baseman Eric Sloper stole third base and then made it home after the error by Tanner. This got the Rams on the scoreboard, helping them earn a 1-0 lead against the Blue Knights. In the very next at-bat, Rams sophomore center fielder Brenton Doyle reached first base on an error by Blue Knights senior second baseman Mickey Barea, which gave Atkinson plenty of time to come home to score to give the Rams a 2-0 lead. Shepherd’s lead grew to 6-0 later on in the inning thanks in part to two two-run home runs to left field by Hamel and junior catcher Eddie Nottingham that really blew the game wide open for the Rams. 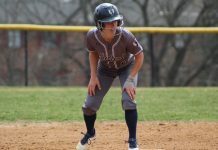 The bottom of the third inning was disastrous for the Blue Knights to say the least, as they could not find a way to hold the Rams’ offense in check. This theme would hold true in the bottom of the fourth inning, when Hamel launched a two-RBI down the left field line that increased the Rams’ lead to 8-2 at this point. Nottingham and Doyle rounded out the Rams’ scoring campaign in the bottom of the fifth inning with a two-run home run and a two-RBI double, respectively, which brought in four more runs to help the Rams take a commanding 12-2 lead heading into the top of the sixth inning. The Rams had a little reason to be concerned in the top of the seventh inning despite this large lead, however, thanks to a three-run inning by the Blue Knights’ offense. Tanner and Barea produced an RBI-double through the left side and an RBI-single up the middle, respectively, to bring home two Blue Knights base runners to trim the Rams’ lead to 12-4. Guerrero reached first base on a fielder’s choice later on in the inning and was credited with an RBI when Tanner came home to score from third base, reducing the Rams’ lead to seven with a 12-5 score. This would be as close as the Blue Knights would get, however, as the Rams would get Blue Knights sophomore short stop Daniel Quiroz to pop out two batters later to end the scoring threat for the Blue Knights, preserving the 12-5 victory for the Rams. 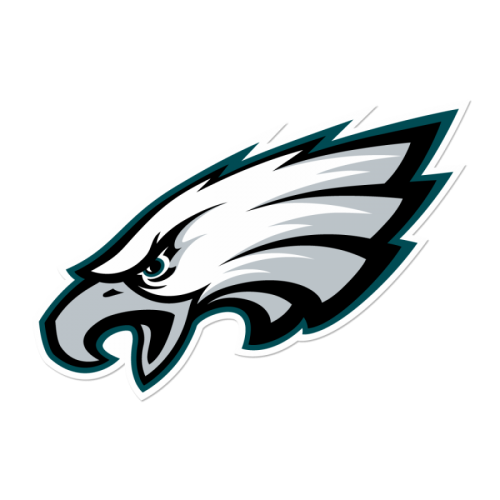 Beall (L, 1-1) had a tough time navigating through the Rams’ lineup, but his defense let him down numerous times against the Rams on Thursday afternoon. In four inning on the mound, Beall allowed 10 runs (five earned) on seven hits, walked one, and struck out just two Rams’ batters. In the winning effort, Smith (W, 4-1) produced a valuable performance for the Rams. Against the Blue Knights, Smith pitched six innings, allowed two runs on six hits, walked three, and struck out five Blue Knights’ batters. On Friday afternoon, April 6, the Rams will again play a home double-header against the Blue Knights. The first game is scheduled to begin at 1 p.m., followed by the second game of the day at 3:30 p.m.